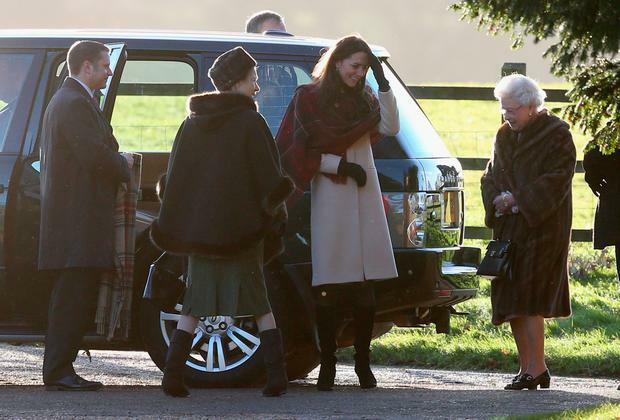 The Duke and Duchess of Cambridge (right), Prince George, Princess Charlotte followed by Carole, James and Michael Middleton arrive to attend the morning Christmas Day service at St Mark's Church in Englefield, Berkshire. Christmas can be a daunting task, no matter where you live. But, when you spend most of your time behind palace gates, the normal procedures of the festive season can be even more complex. There are ways of doing things - as they have been done for decades - ways to dress, knowing when to curtsy and to whom, and their idea of a good time doesn't involve overindulging in hot whiskey and mulled wine. Paul Burrell, Princess Diana's former butler gave some insight into the goings on of a British royal Christmas in which all the high ranking royal family members and select guests celebrate the occasion at Queen Elizabeth's Sandringham estate; which, on paper, sounds great. As is the case with flesh coloured tights, hemline length and nail polish colour, there's no day off for protocol, even on Christmas Day. Burrell described it as "Downton Abbey on speed", saying that some of the more ambitious representatives in the inner circle take advantage of having unbridled access to the monarch and "it's the one time that they can sit down with the head of the family and make an impression". As expected, Queen Elizabeth will be hosting the festivities alongside husband Prince Philip, and will be joined by next in line to the throne Prince Charles, who has been a mainstay at the festive celebrations for years, alongside his wife Camilla. Like most couples, Kate Middleton and Prince William alternate between families every year in order to keep everyone happy. After spending 2016 with the Middletons in Bucklebury, Berkshire, it was expected they would return there once again, but Kensington Palace confirmed they are on the list for Sandringham, as are their children Prince George (five), Princess Charlotte (three) and Prince Louis (seven months). Prince Harry and wife Meghan Markle will also be attending together for the second year in a row, so she is already familiar with the customs. It was reported earlier this year that her mother Doria Ragland, who splits her time between London and Los Angeles, would be joining her only child, but now that looks uncertain. Royal correspondent Victoria Murphy said on Yahoo UK's The Royal Box, "My understanding is that she’s not going. I don’t think that’s because they weren’t able to or anything like that, I just think it’s not usual for in-laws to go." In addition the 'Fab Four', Prince Andrew and daughters Princesses Eugenie and Beatrice are both normally in attendance, as are Princess Anne and husband Sir Timothy Laurence, Zara and Mike Tindall and their children Mia and Lena, Peter and Autumn Philips and their children Savannah and Isla, among others, rounding off a guestlist of approximately 30 people. What do they get up to? Throughout the day on December 23, royals begin to arrive by order of rank, as they do all public events (the highest ranking is usually the last to arrive) and Kate and William prefer staying at their nearby home at Amner Hall with their children. 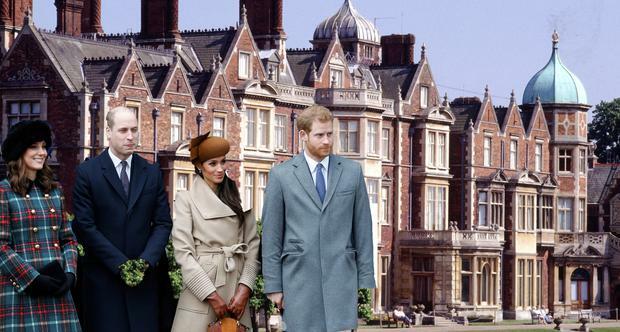 Last year, it was believed that Meghan and Harry stayed at the Norfolk estate, but, amid rumours of an ongoing rift between the couples, it's more likely they will be holed up somewhere in the expansive property, set on 20,000 acres. On Christmas Eve, the royals lay out their presents on the table and exchange gifts at 5pm. 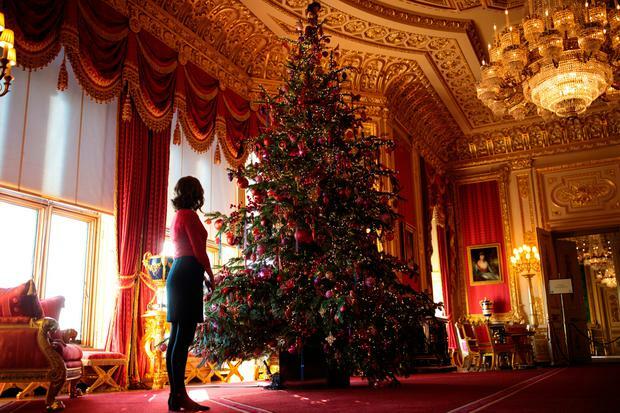 It's the children's duty to put the finishing touches on the tree, which is set up in the White Drawing Room. At 8pm, a black tie dinner begins, with men in tuxedos and women in gowns, and ends at approximately 10pm. Come the morning of Christmas Day, they attend a morning service at St Mary Magdalene, Sandringham, a building which dates back to the 16th century, and greet waiting crowds who gather in the cold for a glimpse. Their full lunch is served at 1pm before nestling in to watch the Queen's speech, which airs in Britain at 3pm, and afterwards, they enjoy a buffet diiner. Every year, Queen Elizabeth gives puddings to her staff, which is paired with a personalised card. She personally hands out gifts to staff at Buckingham Palace and Windsor Castle. Elizabeth and Philip tend to head to the country estate a few days before in advance of the influx of activity. They also host a lunch at the palace this week to accommodate guests who won't be able to make the Sandringham event. They began celebrating at Sandringham in 1988 after Windsor Castle, which had hosted the festivities from the 1960s, was undergoing restoration construction. "I first came here for Christmas as a grandchild. Nowadays my children come here for the same family festival. To me, this continuity is a great source of comfort in a world of tension and violence," she said in 1995. Andrew said that Monopoly has been banned from the day as the competitions gets "too vicious" between the family. On St Stephen's Day, the male royals go on an annual pheasant shoot, but this year, after 20 years of taking part, Harry will be skipping it at his wife's behest. Meghan is an animal rights activist and he declined to participate last year as well, when he was joined by his fiancée. "Harry’s always loved hunting and it has provided them with a great chance to bond as brothers," a source told the Sunday Mirror. "But now it looks like Harry’s shooting days are over. It’s the latest point of contention between the princes." The Middletons have also been known to join the family on the second day celebrations.